As software developers, we encounter bugs on a daily basis - software bugs of course! And as a matter of fact we never write a single program without going through the code "debugging" to understand the flow of the program or fix it when something is malfunctioning. So, where do the terms "bug" and "debug" originate from? 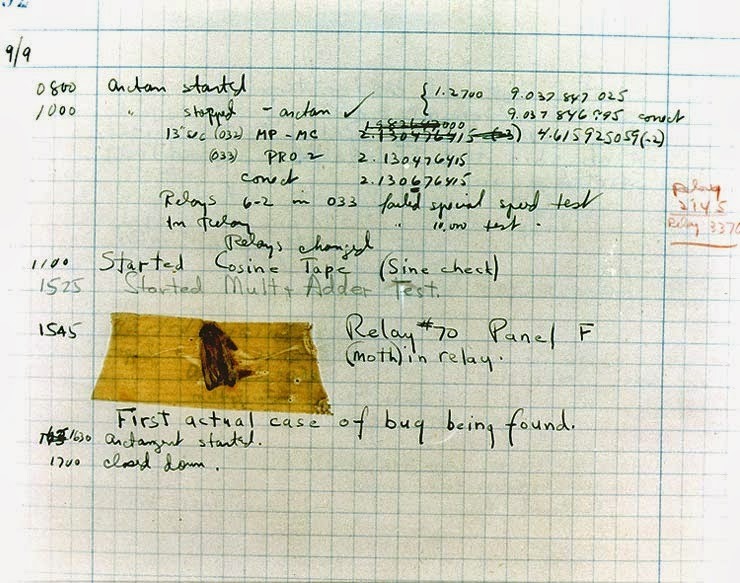 It is said that the computer pioneer Grace Hopper was working on a Mark II computer at Harvard in the 1940s when her associates discovered a moth stuck in the relay and thereby impeding operation. Hopper then remarked that they were "debugging" the system. And the term went viral, Hopper was credited with popularizing the term "debugging" for fixing computer glitches. The remains of that moth can still be found at the Smithsonian Institution's National Museum of American History in Washington, D.C. [pictured below]. It has been just so in all of my inventions. The first step is an intuition, and comes with a burst, then difficulties arise — this thing gives out and [it is] then that "Bugs" — as such little faults and difficulties are called — show themselves and months of intense watching, study and labor are requisite before commercial success or failure is certainly reached.